BANGKOK: Activists campaigning for internet freedom have slammed the government’s recent move to develop a single internet gateway to expand state control over online media. Netizens' rights activists TNN fear that the ICT Ministry's standard page for attempting to access a blocked website will become a lot more common. 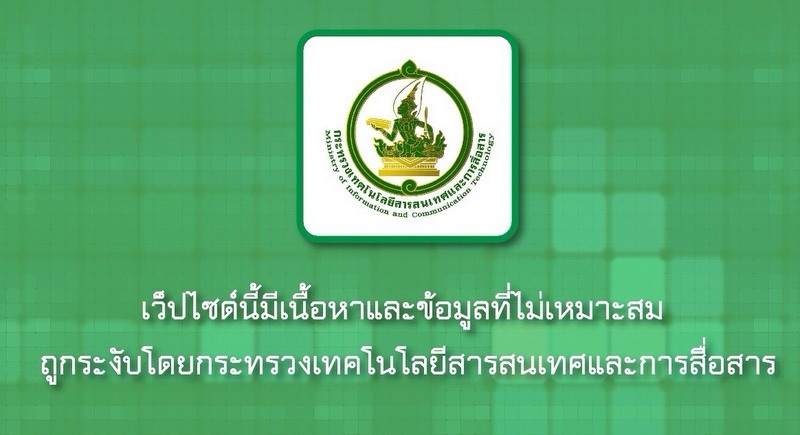 Last week, citizens learned of the government’s intention to build a single gateway, after it ordered the Ministry of Information and Communication Technology (MICT) to take steps to channel all traffic in or out of Thailand. According to an army source, the single gateway will be implemented to control access to websites deemed inappropriate and monitor the influx of information from abroad. The National Council for Peace and Order (NCPO) is concerned about the increasing number of political messages conveyed online, criticising the government and defaming the monarchy, the source said. The plan is designed to target websites with domains that are registered abroad, which the Thai government cannot order closed down, the source added. Arthit Suriyawongkul, coordinator of the Thai Netizens Network, said internet gateways are like international airports. They are doors connecting Thailand to the world, and all online traffic must pass through them, he explained. Thailand currently has nine gateways, with private Internet Service Provider (ISP) companies that act as gatekeepers. If the plan goes through, the state-owned CAT Telecom enterprise will be handed control of the single channel. But it is still unclear how the single gateway will work with the existing nine. The activist warned it would allow the state to possibly filter all online content available in Thailand. While the government is already capable of regulating netizens’ access to information – by blacklisting certain websites or ordering temporary shutdowns – reducing the number of gateways to one will make its work easier, he added. If they want to block certain domains, authorities currently need to seek court orders or issue formal letters asking ISPs to follow through. The process takes too long to effectively bar users from viewing the content. “If the single gateway is implemented, CAT Telecom will be able to block access by itself. It will be faster and more efficient for them,” Mr Arthit said. Meanwhile, ICT Minister Uttama Sayanaya and government spokesman Sansern Kaewkamnerd denied claims the plan would violate web users’ rights to information. But rights advocates continue to view the plan as a way for the NCPO to control information in Thailand. Activists’ concerns originated in July 2014, when the military government ordered the creation of a panel to monitor media content, including online platforms. Mr Arthit said the panel’s work hit a barrier when tackling online information, due to websites' encrypted data, which the government cannot crack. Jittat Fakcharoenphol, a computer engineering professor at Kasetsart University, says the inability to read encrypted information means authorities cannot spot the specific content they wish to wipe out. They must then shut down the whole domain. “Such a move would hardly go unnoticed,” he said, referring to previous attempts by the NCPO to block access to Facebook, sparking a public outcry. Last December, the Thai Netizens Network uncovered a letter from the MICT, ordering experts to come up with ways to intercept encrypted information from internet users. The government may apply tracking devices on internet gateways to accomplish that, Mr Jittat explained. If the state operates its own gateway, it could do so without having to ask for the consent of ISP companies. It’s unclear whether the government already possesses such tools. But Mr Jittat believed the MICT or ISP companies employ expert engineers capable of developing them. If they succeed, it will lead to severe violation of users’ right to privacy, he argued. Since last year’s military coup, the crackdown on online content has become more severe, rights advocates argue. “There is a climate of fear prevailing,” said Nutchapakorn Nummueng, a representative from the legal watchdog iLaw. Many websites have already been shut down. Individuals have also been arrested and detained for criticising the government or the monarchy on social media. State scrutiny placed on internet platforms leads to a situation where many do not dare to express their views and limit their own freedom of expression, Mr Nutchapakorn added.